Jake Oleson’s “IVRY” is the kind of work that people love to call “lyrical” because of how it evokes emotions as a visual poem. While this is a documentary, it reminded me of fictional works such as David Gordon Green’s “George Washington,” Jeremiah Zagar’s “We The Animals” (available soon) and the films of Terrence Malick, films that bring in inexperienced actors and let them improvise to add something deeper to the narrative and filmmaking process. “IVRY” is a profile documentary about Ivry Hall, a young man from the South Side of Chicago who boxes, and teaches boxing to the younger kids in the neighborhood. When we hear him speak, we soon realize that he is speaking to one of his students (Elijah), offering wisdom and life lessons designed to push this kid in the right direction when the situation could push him into several other undesirable directions. Ivry has been in jail many times since the age of twelve, has had multiple tattoos and has seen everybody close to him fall off the edge never to be heard from again, because that’s what this neighborhood (Englewood, to be precise) has to offer. Ivry makes the point (in so many words) that we have more to offer ourselves than what our environment can give us, if only we look deep within. In just under 10 minutes, Oleson presents a deeply layered profile of someone who narrowly escaped the probability of having a short life and who now has a future in front of him. Oleson and cinematographer David Vollrath shot the film entirely in 16mm and it looks wonderful; Jay Wadley’s beautifully haunting score anchors "Ivry" without much of a break so that it feels like a whole piece where every moment matters. “IVRY” is a solid documentary short made with great confidence and with a subject worthy of such beautiful treatment. How did you find you subject? I first met Ivry four years ago while shooting a series of short docs for a non-profit supporting his boxing gym, the Crushers Club. It’s an amazing organization run by this force of nature, Sally Hazelgrove, providing a safe space for at-risk youth in the South Side of Chicago to turn to instead of the gangs. Ivry was thirteen at the time and we managed to shoot this incredible match of him sparring on this sweltering hot night in July. Four years later I’m back in Chicago and decided to visit Crushers. I was shocked to find out most of the kids I met were no longer involved in the gym. Only a few remained, one of them being Ivry. I learned that a lot of kids had either been killed, incarcerated or fell back into the gangs. I invited Ivry out for coffee in March and he told me all about his upbringing in Englewood—how he had been to jail multiple times before the age of twelve, and how he completely changed his mindset after his mother passed away at thirteen. He spoke so eloquently about his experiences for a seventeen-year-old, but also had this intense drive that blew me away. I wanted to know what had instilled that fire within him, and what made him outlast all of the other kids who left the gym these past four years. It quickly became apparent that this was worth exploring in a film. It may seem a bit backwards to shoot a documentary on film but ever since I first tried it a few years ago it’s completely upended my youtube-generation approach of shooting absolutely everything involved with the story. The limitations have been freeing in a way and have helped me focus my ideas and stay sharp while shooting on the fly. How much of what we’re seeing is documentary, and how much is reenactment (if any)? There were points in Ivry’s story that I wanted to underline with more of a cinematic approach, but others that I wanted to be less heavy-handed and more raw. So we shot a lot more traditional fly on the wall coverage in the first few days of the shoot and slowly built out the steadicam scenes with Ivry’s help as the shoot progressed. So all of the steadicam scenes were staged and based off of previously captured moments and everything else was more fly on the wall. I think we struck a nice balance in the edit between the two approaches that fits with the different points of his story. But ultimately it was about letting the story dictate the tone and throwing out any visual ideas that seemed to water things down. The voice over was taken from a fifteen minute conversation I recorded between Ivry and Elijah two weeks before the shoot. During production, we shot another candid conversation between the two of them at the gym to help give context to the viewer. The boxing scene must have been challenging. How did you end up designing the sequence into what it has become? We originally didn’t think we’d be able to shoot Ivry’s fight at the Golden Gloves because the dates didn’t line up. 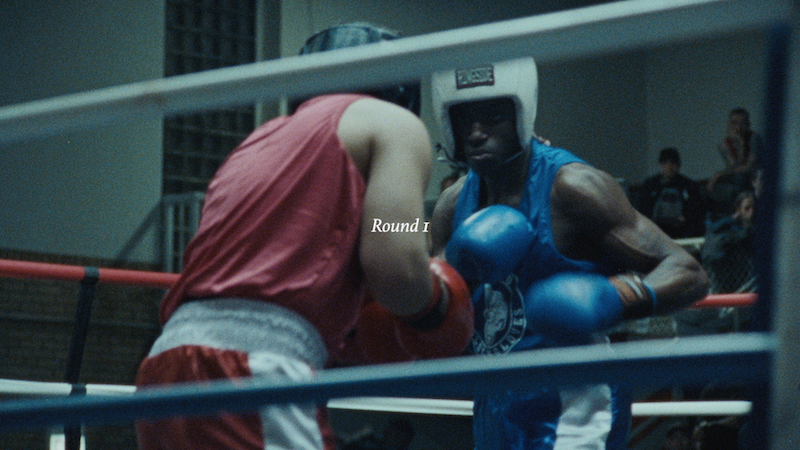 Instead, we shot this surreal sequence of him sparring in the gym with the strobing lights to be the climax of the film. When we came back from shooting the Golden Gloves it was obvious in the edit that the fight would replace the surreal sequence we shot. It sat on the cutting room floor for a few weeks before I decided it might be interesting to use the dreamlike footage as a representation of the fight going on in Ivry’s head. I spent a long time cutting selects that matched different moments from the Golden Gloves fight and spliced them together in a way that hopefully feels like one seamless fight. It took a long time but I feel like the climactic fight now has an electricity to it that reflects the passion that Ivry has to keep fighting in life. The coda at the end brings us right to today. When was this made? Any idea what happened to the kid he was talking to? The Golden Gloves were April 14th, 2018, and we locked the cut early July so just a few months ago! Elijah is currently on summer break from O’Toole Elementary and still training at the Crushers Club with Ivry until he leaves for Alabama State in the fall. I’m currently working on a script for a short about mental illness and in talks of doing a series of short docs like Ivry in the near future. We’ll see what happens!